The government of Premier Wynne has recently backtracked on the McGuinty government's big green deal, launched a consultation on "siting large energy infrastructure" and is preparing to invite input on the next long-term energy plan. The Ontario Energy Board (OEB MSP) recently released the latest report from it's Market Surveillance Panel, and that provides some fresh data, and analysis, through which I can review how the appearance of 'consultation' was manipulated in the past to the detriment of the average Ontario electricity consumer. In 2009 Ontario's economy, particularly its manufacturing sector, was indisputably in trouble. While the government prayed to the wrong deities, and had their prayers answered with the the Green Energy and Green Economy Act, Ontario's largest users of electricity sought to avoid the coming cost increases, and many of the charges they already incurred, by lobbying privately with government insiders. The rumour was that it was the provincial Environment Minister who took up the cause and rammed through a change to the global adjustment mechanism that rewarded large users of electricity, now known as "Class A" customers, for being large users of electricity. The changes occurred out of the light of disclosure and under the green cloak of the environmental registry. This is not meant to slight the accomplishment of the Class A mechanism in reducing costs for Ontario's largest consumers of electricity. 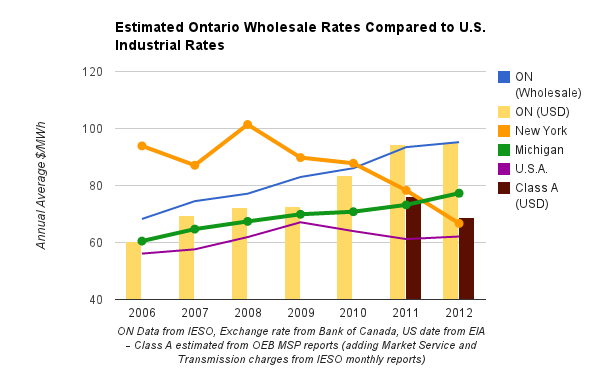 Piecing together bits of information from the OEB MSP reports U.S. EIA and Ontario's IESO, it seems the program was very successful at transferring costs from Class A to other consumers. Unfortunately, the accomplishment came at a rather steep cost if one is to place the level of faith in "conversation" espoused by Premier Wynne. "[providing] large consumers with a strong incentive to reduce consumption at critical times ...By reducing peak demand, the proposal is expected to avoid costly investments in new peaking generation resources and imports ..."
"Concerns have also been raised that large volume consumers, who are not the primary drivers of costs to meet peak demand, are paying more than their fair share of costs." "provides large consumers with an incentive to reduce consumption during peak periods when the system is under greatest duress, reducing the need for additional, expensive peaking resources." The comments submitted to the registry have not been released , so we can't know what was knowable with foresight, but in hindsight these 3 things are nonsensical within the context of Ontario's electricity sector. The recent OEB MSP report shows that, for May-October 2012, grid connected Class A customers averaged an "effective price" of $46/MWh. The legacy hydroelectric assets of the public generator, built on the public dime inspired by slogans "power at cost" and "the gifts of nature belong to the public", are the only assets that produce electricity at a regulated price of under $46/MWh. The gifts of nature belong to Class A customers? The argument made at the creation of the Class A pricing was that because large users consumed a lower percentage of total consumption during system demand peaks, they were overcharged because the total system cost was, in a theory, set by the need to supply peak demand. This is also the justification for continued spending on demand reduction programs. It's simply not reflective of what is driving costs in Ontario, particularly since 2009 and the Green Energy Act. 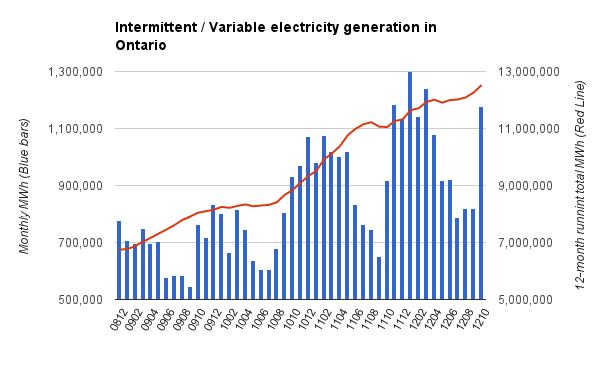 A review of what is changing in Ontario, and other jurisdictions pursuing variable Renewable Energy Sources (vRES), will demonstrate the reality contradicts the assumptions inherent in a Class A mechanism; peak demand does not set peak pricing, and spending on generation is not being driven by the ability to meet peak demand. Since the end of 2009 new or refurbished gas, nuclear, hydro and other traditional generating capacity has essentially equalled retired coal capacity. Operationally, the ability to meet peak demand hasn't changed much, but the flexibility of the system has been reduced. Overall, generation has increased due the addition of wind and solar (vRES), technologies which are procured under, essentially, 'must take' contracts. The OEB MSP report noted the impact of self-scheduling supply, which is increasing precisely due to the additions of vRES - but the MSP doesn't properly assess the impact of the new suppliers. I've transposed the OEB graph to provide a view of the data I think is more meaningful as it displays the constant growth in "self-scheduling and intermittent" generation, as well as the fact the least productive period for the category is the peak-hourly demand season of summer. There are some important things to know about the impact of this chart on the overall system. Contrary to the theory used in justifying the Class A mechanism, vRES additions have not been particularly impactful during the peak demand summer season, but in 2012 there was an improvement due to additions becoming much more heavily weighted to solar. 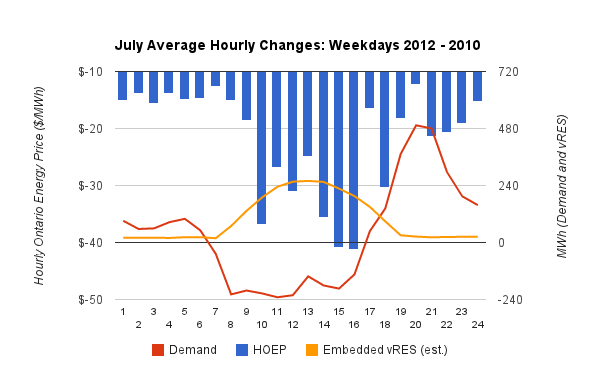 Comparing average weekday metrics for July in 2012 and July 2010 is instructive. According to the OPA, vRES supply essentially doubled over the period; solar from 52 to 564MW and wind from 1237 to 2015MW. I've included my estimates of the embedded vRES production on the chart of the differences from July 2010 (the summer before Class A), and 2012's July. It appears what the IESO data shows as decreased daytime demand is increased solar generation, with an actual spike in demand coming in the evening. 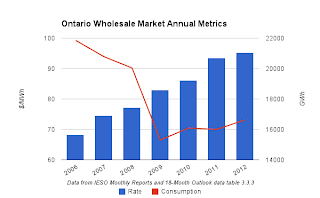 Ontario forced 'smart' meters on all residential customers and sets lower "off-peak" rates to begin at 7pm, so perhaps the demand change spike, as solar ceases its daily production, is designed into the system through setting time-of-use hours. Regardless, we should expect the darkness to increasingly bring the day's highest prices as falling vRES is accompanied by continued high, and perhaps rising, hourly demand. Class A is not based on 5 hours where curtailment is most likely to be needed, and it also is not necessarily set by 5 highest daily demands. The one-hour period in the base period in which market participants withdrew the greatest total net volume of electricity from the IESO-controlled grid. And so on, until the 5 hours of highest daily "withdrawal of net volume of electricity from the IESO-controlled grid" are established. Because the IESO does not know embedded generators' hourly productions, it can't actually know how much electricity is on the IESO controlled grid; every house has a smart meter - the IESO runs the data repository for all that data - and yet the far smaller group of embedded suppliers is not tracked by the IESO. This is the process for determining the share of the global adjustment to be paid by a Class A customer. For the high five hours the IESO contacts local distribution companies to collect embedded generation figures. The total of the generation on the IESO grid and embedded generation becomes the denominator in the equation determining a Class A customer's share of consumption. The High 5 determining the Class A global adjustment rates for the current period aren't the high 5 in terms of demand. In a previous post I had embedded this spreadsheet, which shows the 6th highest hour on the IESO grid was windy - whereas hour 5 was not. The embedded generation at hour 16 of June 21st would drive the total generation, and thus the total demand, above the not windy hour 16 of July 6 (2012). I sorted that spreadsheet to demonstrate wind generation acts, in a market, as negative demand - making the idea of setting the high 5 inclusive of more vRES particularly ridiculous - but that's the plan. The IESO presents only the high 5 for the same period. Notice the IESO presentation is sorted by "Net Ontario Load (MW)" - which is the same figure presented as AQEW previously. If the sort order was based on the "Total (MW)" column the order would change significantly - and if "Embedded Generation (MW)" was ascertained for more than 5 hours, the list of the top 5 would be different altogether. In this post I intended to demonstrate the technical inability of Ontario's system operator to determine what the "high five hours" are. The point is currently somewhat moot, as the OEB MSP report noted that Class A market participants don't know what the 5 hours are going to be anyway - so they adjust consumption in any hour that looks like it might be a "high 5 " hour. This strikes me as being besides the point, which is that we are encouraging curtailment, which may include running dirty back-up generators, during periods of plentiful supply. Demand curtailment will almost certainly shift to being required in the early evening hours, particularly in the winter, and the relatively new High 5 tool will quickly become outdated. If Ontario adds anywhere near the planned renewable capacity it has already contracted, the need to curtail supply will be increasingly driven by the weather, and not by demand levels. As the new Wynne government announce more consultations, its important to note the lack of disclosure of the inputs of not only the Class A mechanism on the environmental registry, but the use of the same mechanism inviting comments, still hidden, on the supply mix directive of the previous supply mix directive. The McGuinty government had a history of faking consultation to provide an appearance of diligence while implementing lousy energy policy. If the Premier wishes to be believed, she has some records to release on previous discussions; specifically comments submitted to the Environmental Registry on the draft supply mix and the Class A global adjustment and, perhaps most importantly, the draft Integrated Power Supply Plan submitted by the OPA to the Ministry of Energy in 2011. ...nor have the comments submitted to the registry entry for the supply mix directive included in 2011's LTEP. ... in the August 2010 posting to the Environmental Registry. The price of natural gas - which should set the market price - was much lower in 2012, so this should be the main driver of the price change, but ... the pattern looks similar thus far in 2013 despite natural gas pricing strengthening. (c) a market participant in respect of the net volume withdrawn from the IESO-controlled grid in the course of providing ancillary services in accordance with the market rules.